I have heard the professor speak a couple times. I have read one of his books and always read his articles when I find them. He’s a retired Army officer, a Vietnam vet. He doesn’t fit into any preconceived political category and he always challenges his readers. He’s also a Catholic who’s suffered a terrible personal tragedy as a result of war. There you have it — a succinct description of the three pillars of the decaying edifice that I think we ought to call “Americanism.” Militarism and perpetual war, sexual license promoted as freedom, and the “greed is good”/consumerist mentality. All available for export. Pretty grim situation, isn’t it? But there is hope in the world. It’s called the Catholic Church, the only force on earth which stands in opposition to all aspects of this gathering darkness. More precisely I’m talking about the teachings and traditional morality of the Church which are timeless and have survived unchanged in spite of the failure of most Catholics (myself included) to live up to those standards. It’s time for a restoration of the Catholic Faith in America. We must reject Washington’s “tacit consensus” and oppose it with Catholic solidarity. But we can’t pick and choose what aspects of the Faith we adhere to, based on media-defined categories of liberal and conservative, Republican and Democrat. 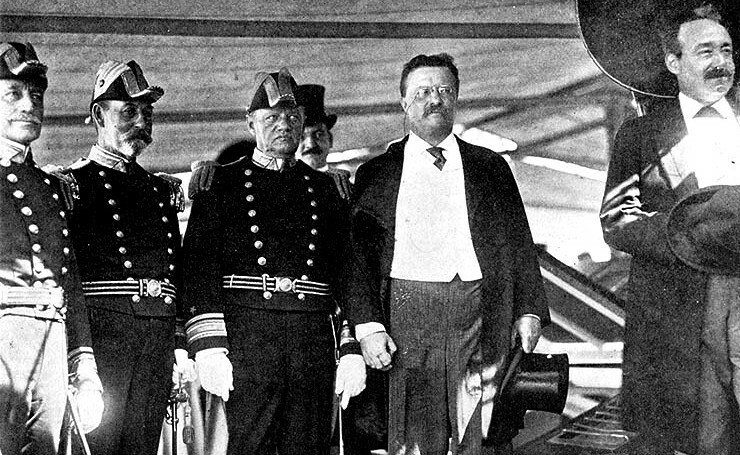 Teddy Roosevelt will turn over in his grave, but we have to be 100% Catholic. All Catholic all the time. We have to defeat Americanism in order to save America. Let’s make that one of our jobs as Catholics. Let’s start a conversation about how to go about it. This entry was posted in Militarism and Christianity on February 28, 2014 by Doug Fuda. The words of a student of Jim O’Connor, a 70-year-old veteran of the Vietnam War who teaches math at a Catholic high school. Never married, no kids of his own. Find out what he does in his free time. A truly heartwarming story. John O’Connor, we salute you. This entry was posted in Saints and Soldiers and tagged Jim O'Connor, veteran on February 28, 2014 by Cammy. This entry was posted in War and Peace on February 26, 2014 by Cammy. Praise (v): to express warm admiration or approval of. Easy to praise. Hard to follow. This entry was posted in CAM jukebox, Militarism and Christianity, Perversion and Propaganda on February 26, 2014 by Cammy. No ROTC and JROTC at Catholic schools! Pope Francis could not be more correct: “the spirit of war comes from our own hearts* Indeed, “the wars, the hatred, the hostility aren’t products we buy at the market: they’re right here, in our hearts.” But, how does such a spirit get into our hearts? Does it come from being exposed to Christlike love as the most important, honorable, noble, heroic and valuable act that a person—young or old, male or female—can desire, imitate, choose and participate in with others? An ounce of prevention is worth a pound of cure, as the old saw goes. With his Petrine faculty of universal jurisdiction, Pope Francis could end tomorrow the terrible child abuse, mind manipulation and anti-mind of Christ practice in Catholic universities and high schools of recruiting and training Christian young men and women for war, that is, he could terminate all ROTC and JROTC programs at all Catholic educational institutions—starting, for the sake of good example, with his own Jesuit community’s educational facilities which are mired in these anti-Gospel change of heart, change of mind, pedagogical operations. It is not God or Jesus or the Holy Spirit that puts the spirit of war into the hearts of Christians. Si vis pacem, para bellum, “If you want peace, prepare for war,” is not the teaching of Jesus. This is contrary to the teaching of Jesus. For a Catholic high school or university to entice young men and women into that spirit or to foster that spirit under the auspices of Christian symbols, liturgy, sacramentals, authorities figures, etc. is blasphemous. Such a school, or Church drives the spirit war like a stake deep into the Sacred Heart of Jesus which the person received at his or her Baptism into Christ. *Psychic activity is usually associated in the Bible with various organs. The chief of these is the heart. The Biblical idiom differs from the modern idiom in considering the heart as the seat of intelligence and decision, whereas today we would use mind and will. In the Biblical idiom the heart is the source of thoughts, desires and deeds. Thus a man is what his heart is. “The spirit of war which comes from our own hearts” is not only a personal spiritual problem for the individual Christian, it is equally, perhaps primarily, an institutional Church problem. This entry was posted in Documentaries and Film, Militarism and Christianity, Perversion and Propaganda, Pope Francis, War and Peace on February 26, 2014 by Cammy. This entry was posted in Pope Francis, War and Peace and tagged Hunger Games on February 25, 2014 by Cammy. “War is a scandal to be mourned every day. We see war in the newspapers ever and we’re used to reading about it: the number of its victims is just part of our daily accounts. We hold events to commemorate the centenary of the Great War and everyone is scandalized by the many millions of dead. But today it’s the same… instead of one great war, there are small wars everywhere. When we were children in Sunday School and we were told the story of Cain and Abel, we couldn’t accept that someone would kill their own brother. And yet today millions kill their own brothers and we’re used to it: there are entire peoples divided, killing each other over a piece of land, a racial hatred, an ambition. Think of the children starving in refugee camps… these are the fruits of war. And then think of the great dining rooms, of the parties held by those who control the arms industry, who produce weapons. Compare a sick, starving child in a refugee camp with the big parties, the good life led by the masters of the arms trade. And remember, that the wars, the hatred, the hostility aren’t products we buy at the market: they’re right here, in our hearts. The Apostle James gives us a simple piece of advice: ‘Draw near to God and He will draw near to you.’ But the spirit of war, which draws us away from God, doesn’t just reside in distant parts of the world: the spirit of war comes from our own hearts. This entry was posted in Pope Francis on February 25, 2014 by Cammy. This entry was posted in Documentaries and Film on February 24, 2014 by Cammy. If only every student at a Catholic high school or college was required to read this book! I am reading it now and highly recommend it. 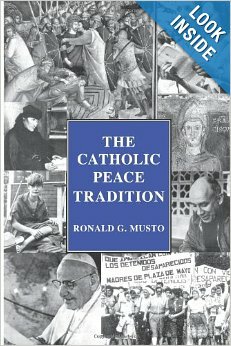 This book is a history of the peace tradition in the Roman Catholic Church from the time of the Gospels to the twentieth century. Its purpose is to show that there is a continuing, unbroken, and self-sustaining stream within Catholicism from the martyrs and pacifists of the early church to John XXIII and the peacemakers of our time. This entry was posted in Civil Disobedience, Conscientious Objection, Just War, Militarism and Christianity, Nonfiction Books, Saints and Soldiers, War and Peace on February 24, 2014 by Cammy. WASHINGTON (Boston Globe, 2/18/14) — For some modern soldiers, caffeine is just not enough to stay vigilant, especially for the growing ranks of digital warriors who must spend hours monitoring spy drone footage and other streams of surveillance data. 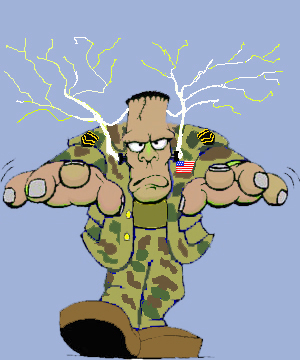 So the Pentagon is exploring a novel way to extend troops’ attention spans and sharpen their reaction times: stimulate the brain with low levels of electricity. It sounds like science fiction, but early experiments using “noninvasive” brain stimulation have been performed on several dozen volunteers at the Air Force Research Laboratory at Wright-Patterson Air Force Base in Ohio. The results show the technique improves both alertness and acuity, researchers say. “We found that people who receive the stimulation are performing consistently,” R. Andy McKinley, a biomedical engineer who oversees the research, said in an interview. Project officials want to study the effects further — especially to determine whether it is safe to stimulate the brain regularly. They expressed confidence that the work could ultimately result in a pair of easy-to-apply electrodes becoming standard issue for some military personnel. The hardware is unlikely to be standard issue for civilians any time soon. For now, researchers don’t envision non-military applications. But some specialists such as Kilgore aren’t so sure that the science is quite there yet to use on healthy subjects regularly, especially direct currents of electricity, which he said rely on “much newer technology than the other ones.” McKinley, too, acknowledged that there are still many questions to be answered, especially concerning any long-term effects. “As far as using it every day, there is almost no data on that,” he said. The Ohio laboratory, however, is “ramping up a study to do that very thing.” —Bryan Bender, Globe Staff. So friends, an initial puzzlement might be, why is the U.S. government and military making this little tidbit of information public now? They have been engaged in EMF (electromagnetic field) research for weapon development and as a means of altering the human personality since at least the early 1950s. Is this the beginning of a “get used to it” public relations campaign to accustom people to the idea that it is proper and right and necessary to electrically juice-up the military’s “cannon fodder class” in order to overcome its human frailities and make it more effective in the defense of national security? Does the idea of putting Dr. Henry Kissinger in bed with Dr. Victor Frankenstein have even a smidgen of sanity to it? Of course not! The lust of the de-empathicized, sociopathic power monger, or of the class of de-empathicized, sociopathic power mongers, is far beyond what the geography of normal consciousness can identify with. But, sane and ordinary folks are aware that those driven by such a lust are brutally dangerous and know no limits in satisfying their lust. But, sometimes even a knowledgeable, hardened, seasoned reporter like Lesley Stahl is taken aback by what such people will do to pursue their ends. When U.S. Secretary of State Madeleine Albright told her, rather matter-of-factly on national television, that the 500,000 Iraqi children killed in enforcing William Clinton’s sanctions against Iraq was a price that was “worth paying” in order to foster U.S. interests there, Stahl was visibly stunned. Would such people as Clinton, Albright, Kissinger and their ilk even think twice about Frankensteining “grunts” and passing laws to mandate it? Remember the macabre, cruelly enforced, mandatory, destructive anthrax vaccination program for all military personnel started under Clinton and George W. Bush? Is there the slightest doubt, that if electrically juicing up the brains of these dumb, stupid animals would help Clinton, Albright, Kissinger and their like make the world as they and their opulent puppeteers want it, that they would not hesitate to turn on the current? And, where do you suppose the U.S. Christian Churches and their leaders will stand on the issue of Frankensteining young Christian boys and girls, whose brains are nowhere near fully developed and who are recruited by the military? Las Vegas is giving 50,000 to 1 odds that they will be standing aside in their impenetrable cocoon of silence, where traditionally go when the issue is a contradiction between military morality and Gospel morality. Vegas is also giving 70,000 to 1 odds that U.S. Christian Churches and their leaders within a decade will be embracing Frankensteining of military personnel as a new avenue for achieving that metanoia, that change of mind, that Jesus called for—much as today they teach that Christian Just War Theory is another way, along with Jesus’ Way, of achieving peace. This entry was posted in Military Culture (of Death) on February 23, 2014 by Cammy.